Kevin Neill is a professional investment advisor with 26 years of experience at TD Wealth. Kevin works with high-net-worth families, small business owners, organizations, and foundations to help build wealth safely, implement tax-efficient strategies, protect what matters, and to leave a legacy. His investment philosophy is simple – quality dividend paying companies and fixed income products, both held for the long-term. Born and raised in Montreal, Kevin holds a bachelor's degree in economics from Concordia University, and holds numerous investment certifications including the CIM - Chartered Investment Manager designation. 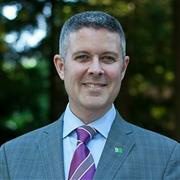 He moved to Victoria in 1992 where he provides comprehensive wealth management, retirement planning, estate strategies, and insurance strategies to his clients helped by a team of TD Specialists.